I’m still a long way from finishing my bootcamp at Flatiron, nowadays I’m working in the Sinatra section, but I have started to think about my life after it and how successfully I can get all the necessary skills to become a competent web developer. Completing the course is a very good first step but I think I should work in other aspects too. I wrote down my motivations so I can check them out when I need it. I felt a little bit down this week because it was hard to me to understand all the connections and how the routes work with Rack, Sinatra, ActiveRecord… It was very confusing at the beginning and I felt overwhelmed thinking that I was losing a lot of time in a lab and that at this path I would never finish my course. It was very handy to read again all my motivations and get a more positive view. I believe that as a future web developer I should start creating my personal library. It seems to me an excellent practice to complete what I learned in the bootcamp reading books. Metaprogramming Ruby 2: Program Like the Ruby Pros (Facets of Ruby). This is the book that I am reading at the moment. I have not yet gone to any of them but I want to do it soon and overcome my fear of ridicule. I think that I still do not know enough but I’m missing out on a great learning opportunity. I’ve already started looking for MeetUps in my city about Ruby or women programmers. It would be great to fill my resume with internships and side projects before starting with my job hunt. I would like to study some structures and algorithms to pass coding interviews. It is too early to start with this but I keep in mind that I would like to use Flatiron services as other recruiters and my Google Fu! Maybe my networking in Hackathons can help me too! I am using Visual Studio Code to follow the HTML fundamentals lessons of Flatiron Bootcamp. In order to get a running local web server to see my code in action I chose to use the following procedure which is valid for MAC or PC and I saw in this website: Visual Studio Code and local web server. String does not match the pattern of "^(?:@[a-z0-9-~][a-z0-9-._~]*/)?[a-z0-9-~][a-z0-9-._~]*$". So I changed the string ‘Demo’ to ‘demo’ and all good. Install Node.js and npm. I follow this website: Installing Node.js and NPM on Mac. This will install lite-server (defined in package.json), a static server that loads index.html in your default browser and auto refreshes it when application files change. Today is my CLI project review and I reserved my day to review for the last time my code and check that everything is working in my interface. As soon as I opened the web page that I am scraping I noticed that they have changed their content. Glup! 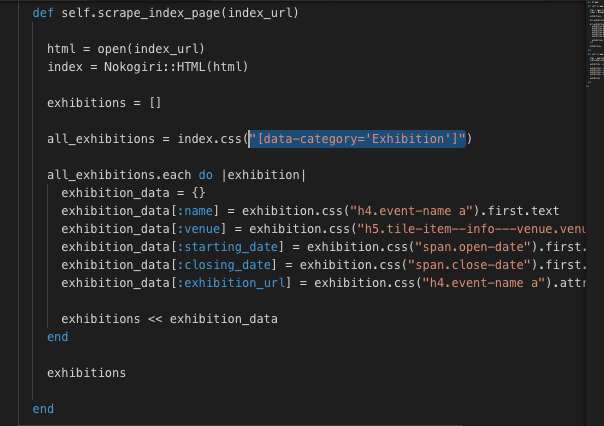 I checked to see if my code was still working….and…not, that new exhibition was not included in my list of exhibitions. PANIC! I am nervous because is my first project review and I really don’t know how is going to be. And now I found that some exhibitions were not included and… Oh! Wait, I found out that that web page has links to more pages. I should scrape those pages too to get a full list of the exhibitions and I don’t have much time. I started to make all the changes to get everything working well. I was inspecting the page but I din’t see why my CSS selector was not working. It seems that only the recommended exhibitions are listed, when I wanted all of them. I tried like 20 different selectors and I can not get that new exhibition! 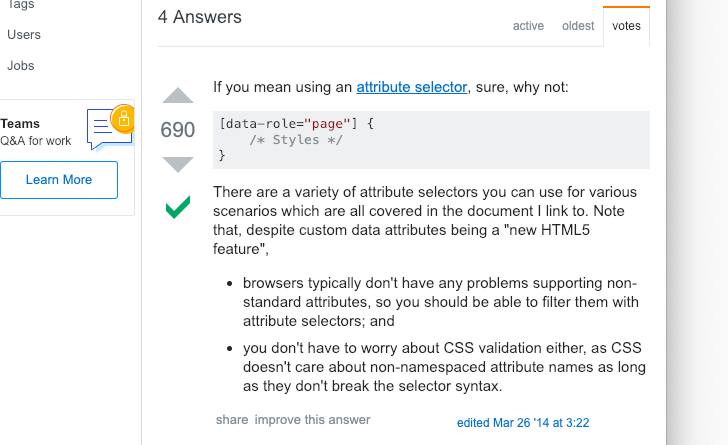 I struggle with CSS selectors… I find them very difficult! OK, everything is fine after all! But I want to share this experience. I have learnt a few new things like how to get attribute info with a CSS selector in a Nokogiri document. And finally I have learnt another important lesson like, when you are nervous and you don’t have much time left, don’t change your code. Don’t break everything in the last minute like I did. Keep calm and later explain what you have found and try to fix it, but not in a rush. Go for a walk, breath some fresh air and take it easy. Chocolate cookies help too. After all the previous steps now I have pretty clear how I am going to structure my code. I want a CLI that displays art exhibitions and gives to the user more info about the one it chooses. I am going to scrape from a public website all the info concerning the art events (Artlyst). I want three classes: a CLI, an exhibition one and a scraper. This three classes will live inside a lib folder. I finally changed the CLI class name for artify in case I want to publish my gem in RubyGems.org. So I have threes classes: artify, exhibition and scraper. To check my code go to my Github repository. After programming my classes I require them inside the environment.rb file. If you want to play with this gem please check this link: readme page. I create a folder bin and create inside of this folder an executable file called in this case as the gem, ‘artify’. When I type: $ruby bin/artify, everything run but I don’t want this. I want that the user from the bash can type: $ ./bin/artify. Then I require our environment file to use all the gems already installed. In this file I want to run for my still imaginary CLI class. I want to write here something like: CLI.new.run. So, at this point, I know I want a class CLI, where I am going to build all the methods and keep all data to run my CLI. I finally changed this name for ‘artify’ in case I want to publish it in RubyGems.org. I would like to build a command line interface gem where I can check art exhibitions and get more info about the ones I liked. -Which exhibition do you want to learn more about? -And it will display more info about the exhibition selected. 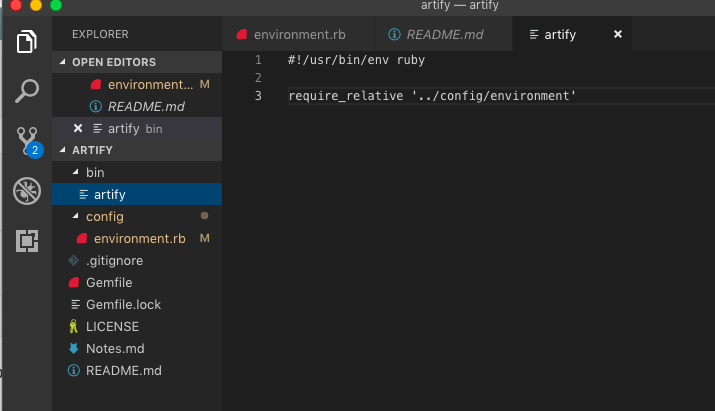 Setting up the environment and the correct structure for a CLI ruby gem. Creating the executable file and starting to make things real. First, I create a repository in Github. Then, I create a new folder in my laptop where I want to clone the repository. I open this folder in my VS code and open the terminal (ctrl + `). I run: git clone + the https from the repository. First, I stage this changes. Second, I write commit message and commit. Third, I push my changes. I don’t have write permissions. I googled this error output and I am trying something I found in stack overflow: sudo gem install bundler. I gave the personal password for my computer and it worked! The purpose of sudo is to execute the command given to it with root privileges. I created a new file gemfile and I am adding my gems to it, bundler. ~> is called “Twiddle-Wakka.” '~> 2.0' means any minor version above 2.0, 2.1, 2.2, 2.3 … and 2.9 included would work (including patches); but version 3.0 wouldn’t work because it indicates a new major version. The second specification '>= 2.0.1'means any version greater than or equal to 2.0.1. Both specifications have to be true, so this gem couldn’t use version 2.0because it’s lower than 2.0.1. 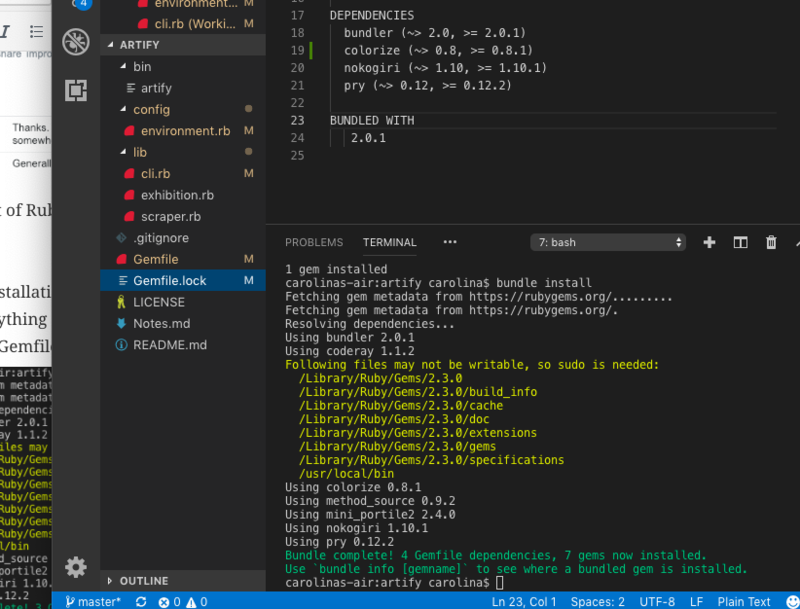 I run in the VS code terminal $git add Gemfile Gemfile.lock. I could staged the changes in my VS code, they do the same thing that the git add command. I check my Github repository….and it didn’t work. Done! I got my two new files in my repository. I check if my changes are in Github and…no! They are not! Why? BecauseI forgot to push them. And I don’t forget about my VSC workflow! Save, stage, commit and push. OpenUri is part of Ruby standard library, I just need to require it. After all this installations I checked my Gemfile.lock and I couldn’t see anything about nokogiri or pry. I run $bundle install and my Gemfile.lock is updated. 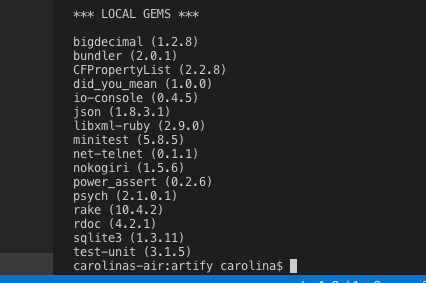 I add my new gem to the Gemfile. And run $bundle install to update my Gemfile.lock. After installing all my gems I need to require them where I am going to use them. Now, I create a folder config and a file environment.rb inside. 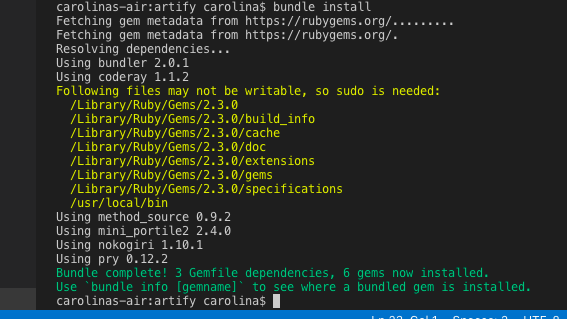 In this file I will be loading, requiring, all of my app’s dependencies like my gems. With this code all the gems that are inside Gemfile are required. I need to require ‘open-uri’ and ‘colorize’ too in my environment. Last week I was working in the Music Library CLI Lab and I was not able to solve the last method I had to pass all the tests. I do not think it was more difficult than all the previous ones but even so I was not able to see what I was doing wrong. Maybe I was tired because I had been studying for several hours and I needed to clear my mind so I took a break. Talking to a friend about this situation, he told me why I did not try to explain my problem to a rubber duck. Yap. I thought he was kidding but when I started working in my Lab I tried it and while I was explaining to the duck my problem I realised what was happening in 5 minutes! 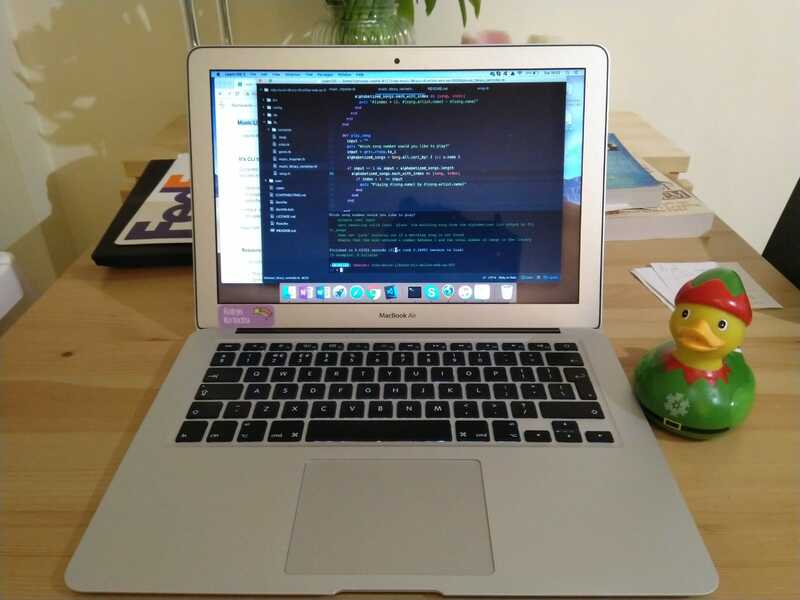 Rubber duck debugging is a method of debugging code and a very effective one. Here I leave a picture of my best study partner!